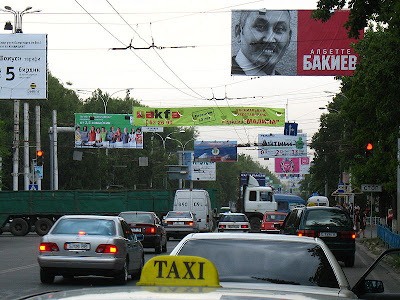 Page F30: Kyrgyz election poster - "Bakiev of course"
Kyrgyz election poster - "Bakiev of course"
You can see on the poster that it says "Albette Bakiev" or "Bakiev of course", which is the same word used in Turkish and Persian and most (maybe even all) Turkic languages as well. In my opinion it's only a matter of time before all Turkic languages eventually switch over to the Latin alphabet, and the most recent countries to have done so have been Azerbaijan, Turkmenistan, and Uzbekistan. The three largest languages still yet to switch over to the Latin alphabet are Kazakh, Kyrgyz and Uyghur, and Tatar would if they could but Russia has made this illegal so the only place where Tatar can be written in the Latin alphabet is online. Kazakhstan and Kyrgyzstan intend to switch over but as far as I know there is no exact date set as yet. The Kazakh Wikipedia can be read in both Latin and Arabic letters as well as Cyrillic.